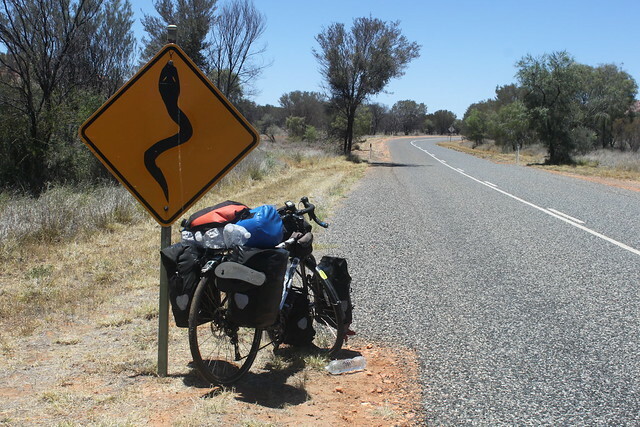 When people ask me how far I cycle a day out here I usually shrug and say “around 100km but it depends on so much – the terrain, road condition and wind”. I don’t think people ever take the wind part seriously when I say that. Let me explain how much I am ‘at mercy’ of the wind. 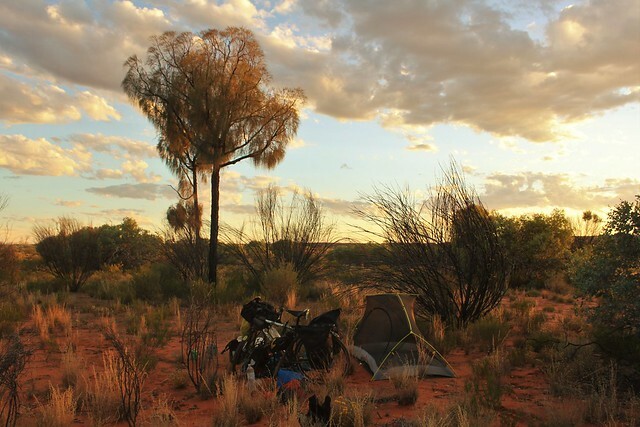 The day before I reached Tenant Creek it took me 8 hours of cycling to cover 90km. After being haunted by headwind the last few days I really didn’t fancy leaving town in the morning but when I looked out the window I saw the trees all leaning in the opposite direction. 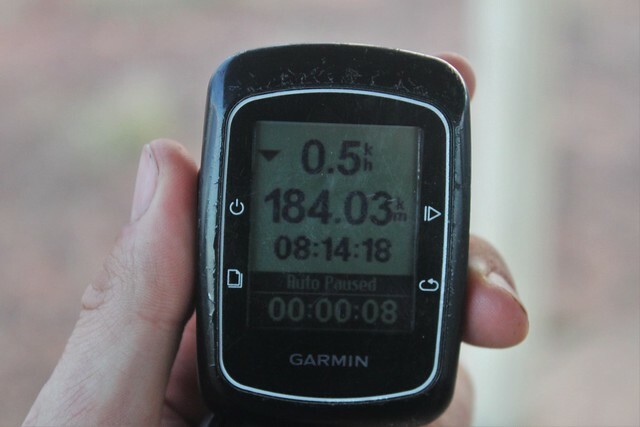 The winds had switched 180 degrees and the day out of Tenant Creek I pedaled 185km in 8.5 hours. Big difference, right? 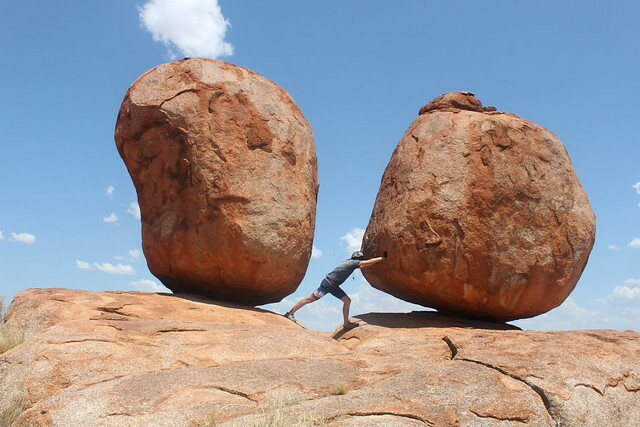 I barely wanted to stop I was having so much fun flying down the Stuart Highway but I did take a break for lunch to explore the ‘Devil’s Marbles’ – a series of huge boulders that sprang out of the dusty outback. Time to ‘rock ‘n” roll’! 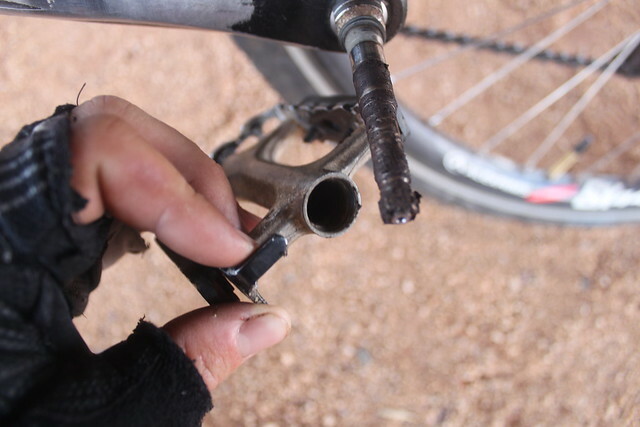 I must have been pumping the pedals hard as suddenly one of them slipped off broken. Oops. The next bike shop was over 400km away. Convenient! Luckily I could balance it on and sort-of keep it in place while I cycled. I hardly had much choice. There were longer distances of nothing. Miles upon miles of mind-numbing emptiness. I had the outback all to myself. 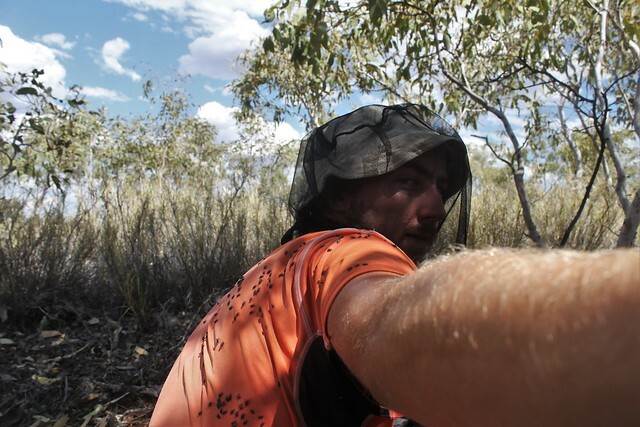 Myself and, of course, millions of bush flies. Did I complain about them in the last blog? Forget that, it was nothing then. A few nosy fellas. Now it’s crazy. Every day there just seems to be more and more flies. I hadn’t believed the people who’d said it could get worse but they were right. Now the bush flies were a plague. I was covered in a cloud of them all day long. All I can hear from dawn to dusk is the zzz of buzzing flies around my head. Eating is a pain. I have to hold my hand over the food as I pass it under my head-net and into my mouth or the flies will hop in with it. I heard a funny story from someone out here: they’d been in an aboriginal community talking to one of the village elders. 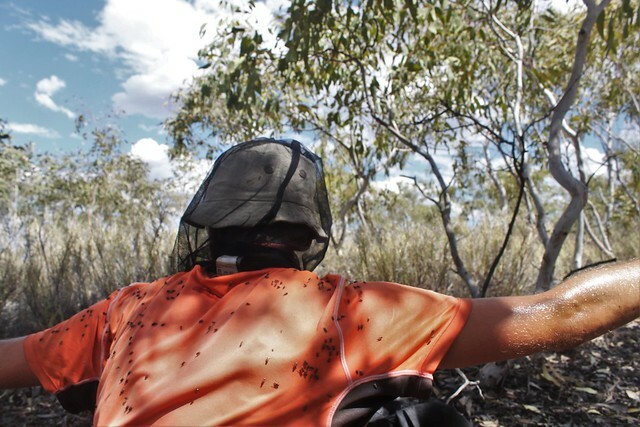 The flies had been super ‘friendly’ that day and were swarming all over this aboriginal guy’s face. He didn’t bother shooing them away, instead he stuck out his tongue and licked his lips catching a couple flies and eating them. 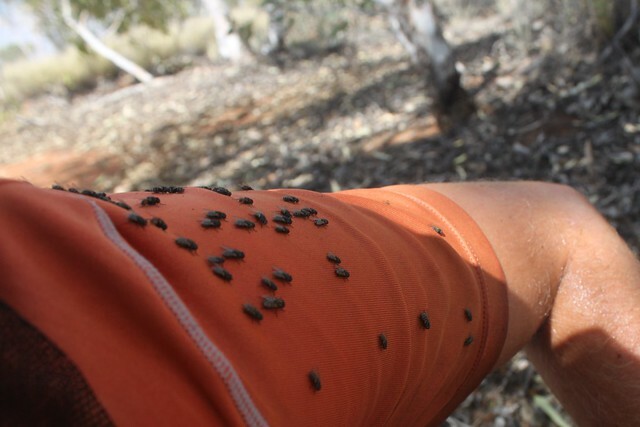 At least if I run out of food there’ll always be the option of a bush fly snack! Turns out they’re worse in the summer months. As if the heat isn’t hard enough! God I wish I was here a few moths ago – it would have been a walk in the park. It’s even hard going for a wee. 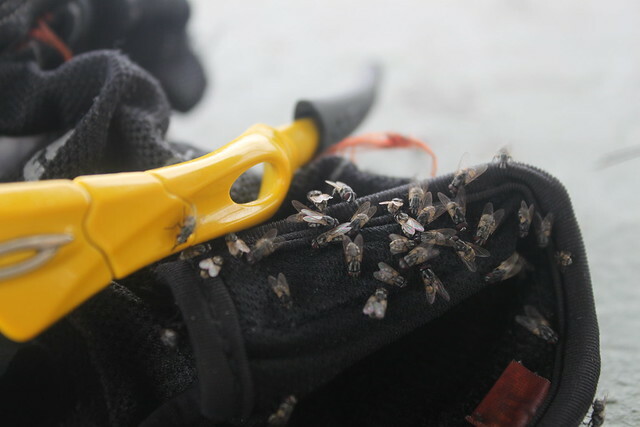 It’s not so easy to build up any pressure while trying to shoo away the dozen flies trying to settle on your bell-end. It’s as if they’re saying to each other: “budge up mate! There’s loads of room for the rest of us on here”. One morning I managed to piss on my fingers whilst trying to use my free hand as a fly shied. And if that sounds bad, imagine how grim the morning poo is. It’s the flies favourite part of the day and I’m squatting in a cloud of them wondering if my life could possibly get any less glamorous. The sky is probably more exciting than the monotonous vegetation. Some days are crystal clear skies but when the clouds are out they dance in patterns stretching across the sky. 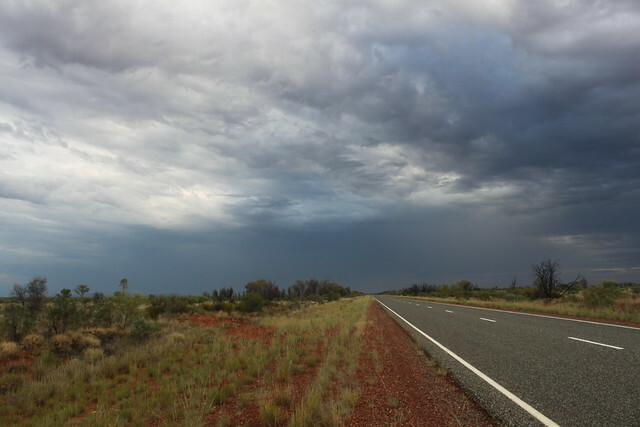 On this particular evening a thunder storm had cut across me a few miles ahead, leaving half the sky a light blue behind a distant black cloud fading into the distance. It was beautiful but for once I wasn’t alone enjoying it. 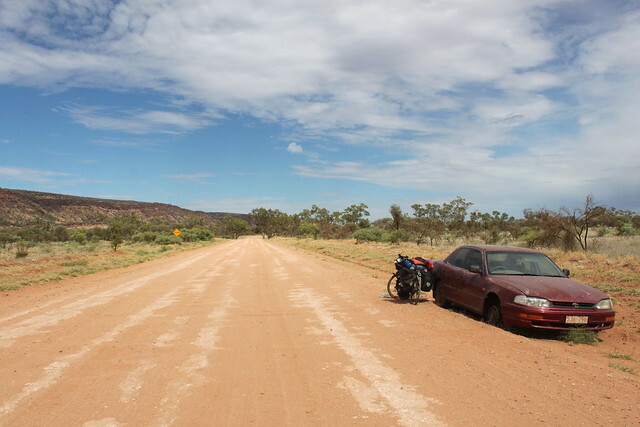 In the middle of nowhere (and I by that I mean at least 50km from the nearest building) a bunch of chubby aboriginal women had parked their car at the side of the road for an impromptu drinking session. They were sitting on the narrow hard shoulder barefoot, pouring a bottle of whisky into cups. 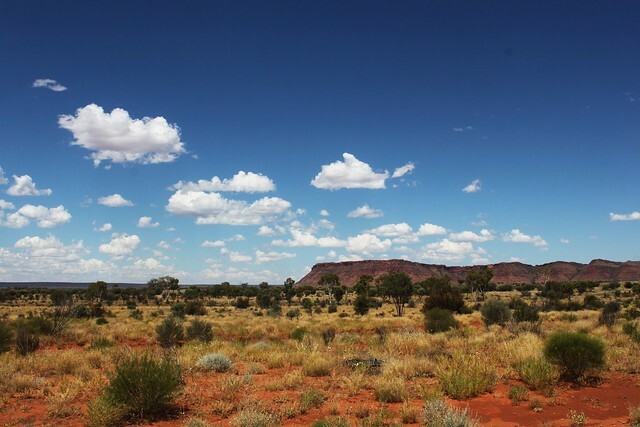 They were probably out here because their community is dry (most of aboriginal communities are out here). I almost did a white man tut before remembering that I’ve gotten drunk in far lass classy locations. I would have accepted their invitation for a drink had it not been so close to dark. I pushed on to the next rest area. 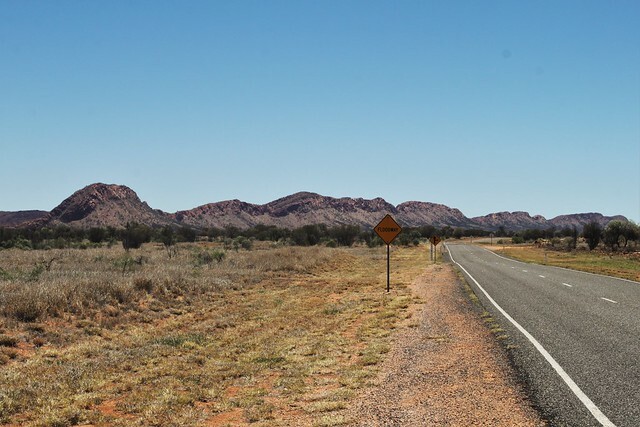 These spots pop up every at least 100-200km on the Stuart Highway, sometimes more frequently. Apparently they’re full in winter but usually I have them all to myself, as I did on this occasion. It had a small phone-signal boosting device that I’d never seen before. It couldn’t had come at a better moment – I hadn’t had phone signal for a couple days and today the US election results came in. 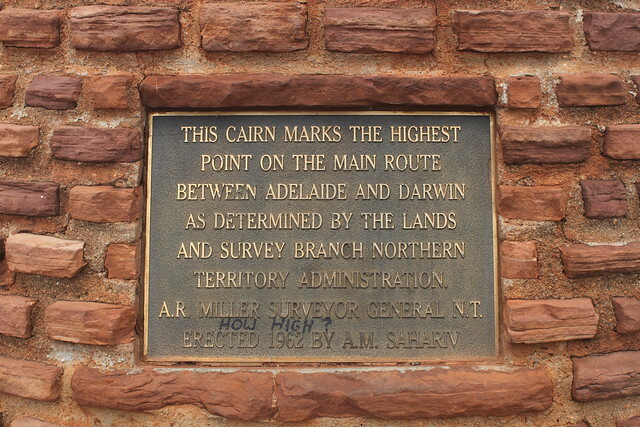 The next day I finally crossed the Tropic of Capricorn. I was probably more excited about cross this line of latitude than the equator. I’d had no idea when I crossed the line of Cancer but I very quickly decided that I hated the tropics. That climate is not for me. 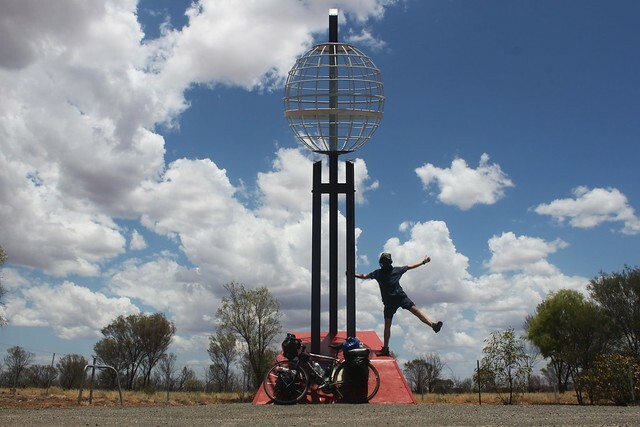 The Tropic of Capricorn – at last! When I realised that the Tropic of Capricorn was only 1,500km below Darwin I decided to bomb it south as fast as possible. I was sick of the humidity and was dreaming about colder nights (ignoring the fact that the desert dry heat may actually be more dangerous in the day time). Actually the climate had changed dramatically already. About 500km further north (just before Tenant Creek) the landscape had shifted. The forests abruptly ended and things began looking much more like the outback of my imagination. About a week ago I’d sat in my tent unable to sleep for the heat. I was only under the mesh layer but there was no breeze to counter the humidity. 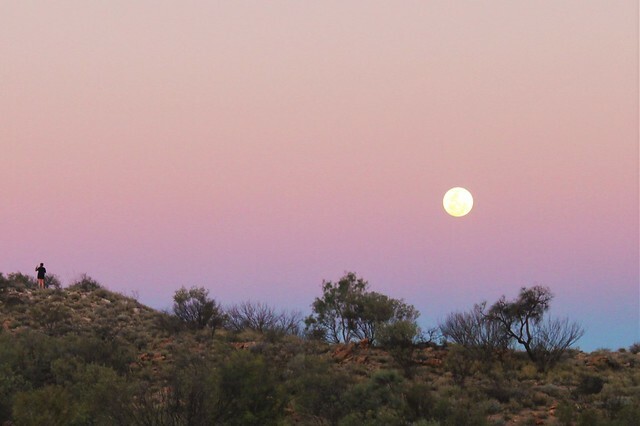 At 10.30pm I’d woken up in a puddle of sweat and checked my thermometer – it was 33C. But now I woke up shivering in the early hours of the morning. It was only 15C! My dreams had come true and what a change it was. 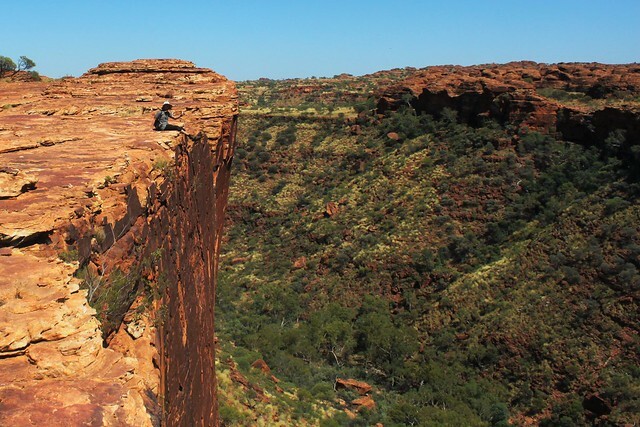 I’d left the Top End and was now in the Red Centre. (Check out the Google Maps satellite view – you’ll see the change). The lack of shade was a problem – I can’t take a break in the sun it’s simply too hot. I need that gentle breeze that I only get if cycling. 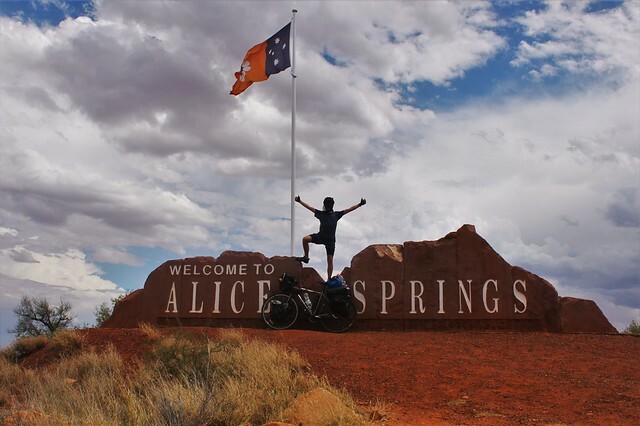 I pushed on and finally reached Alice Springs having cycled 515km in 4 days. 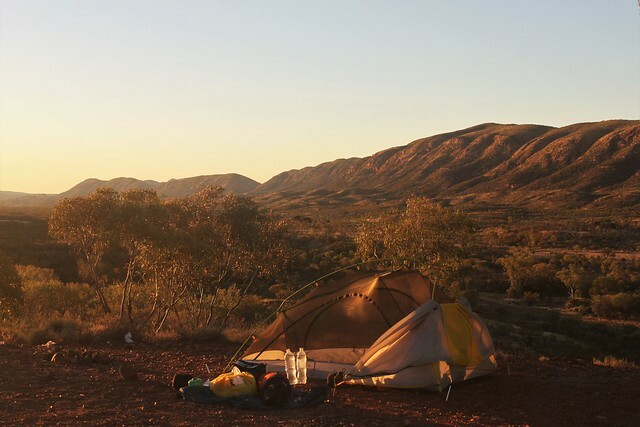 Alice Springs was just what the doctor ordered. 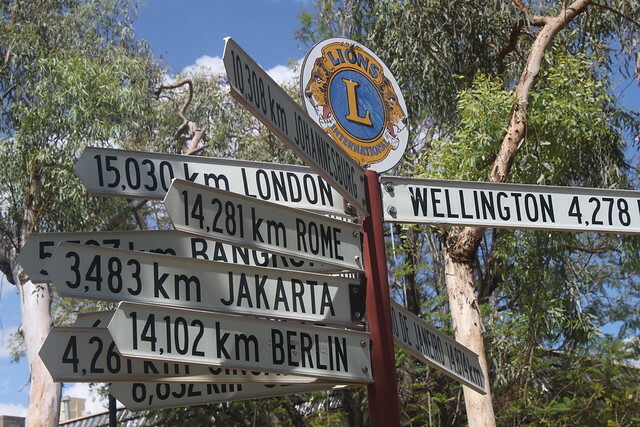 It’s only a little town – but far bigger than any outback settlement I’d passed since leaving Darwin and far nicer than Katherine or Tenant Creek. I stocked up on supplies, bought a long sleeve shirt and cowboy hat (I’ve given up trying to fight the sun) and got my permit to travel the Mereenie loop. 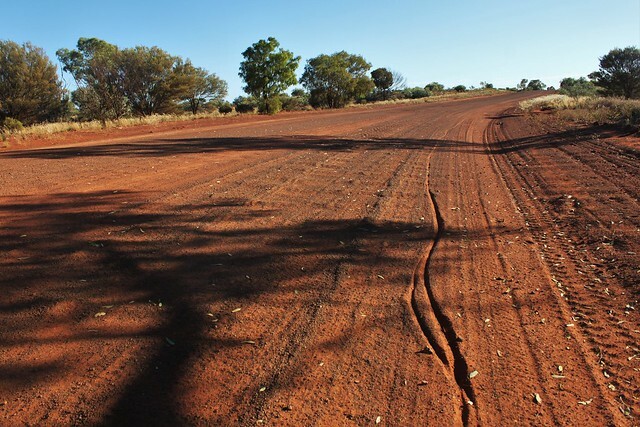 The tourist office in town wouldn’t give me a permit to travel through the aboriginal land (they insisted I had to have a 4 wheel drive) but the Central Aboriginal Land Council gave me one no-questions-asked. Home is only 15,000km away! I’d escaped the tropics and the humid climate. 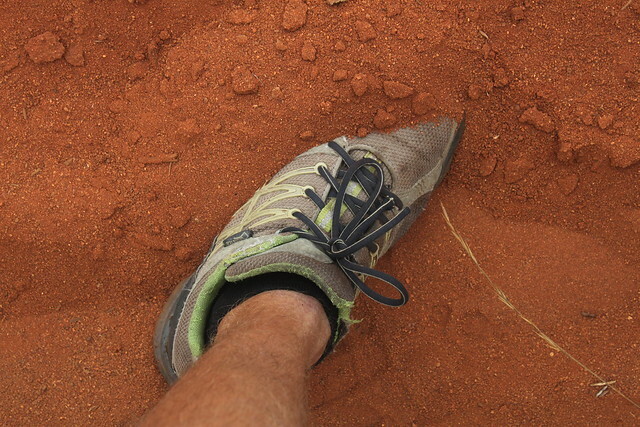 The desert heat here in the centre seemed manageable so I continued my plan to go off on a little detour. 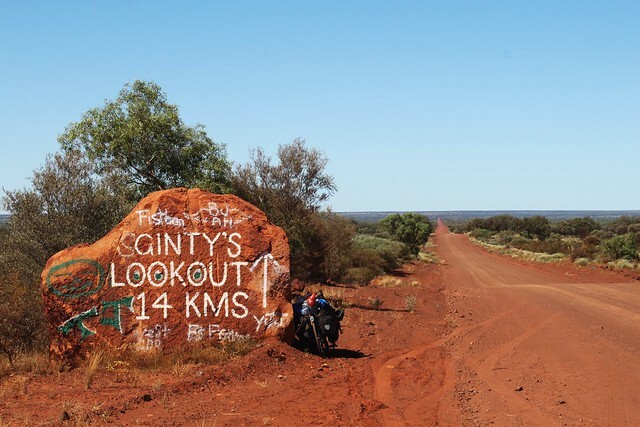 I’d used the Stuart Highway to burn the miles and now, having done that, I wanted to go exploring. 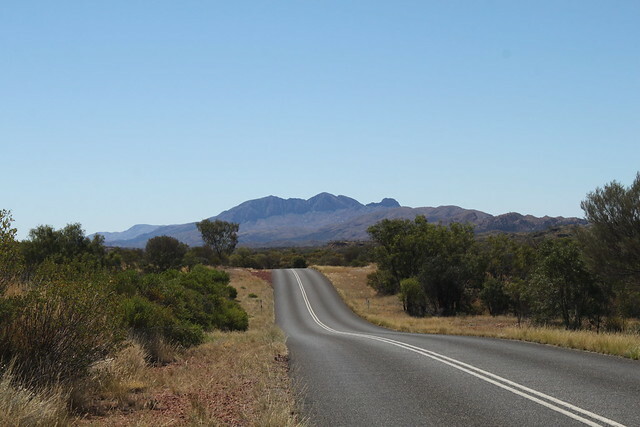 So, from Alice I turned away from Melbourne and towards the West MacDonnell Ranges. Suddenly mountains had grown out of the desert. Big sandy mounds loomed either side of the road. 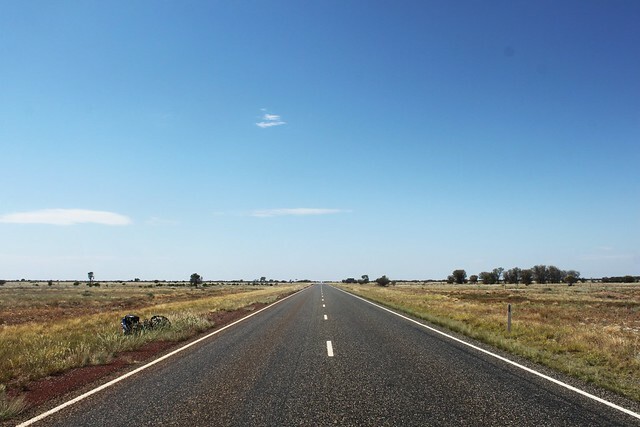 It was beautiful – an adjective I haven’t used to describe a road in Australia yet! 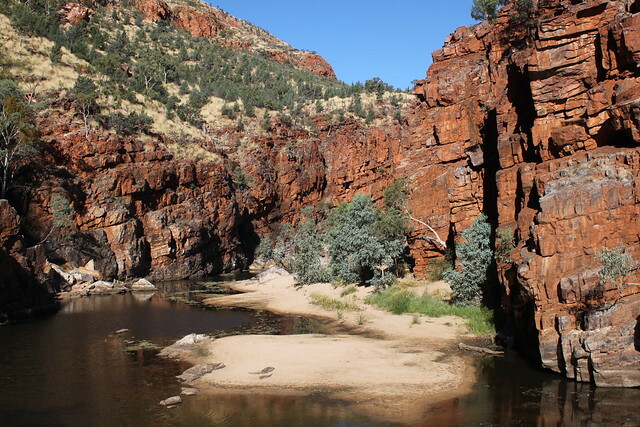 The next day I passed Ormiston Gorge. 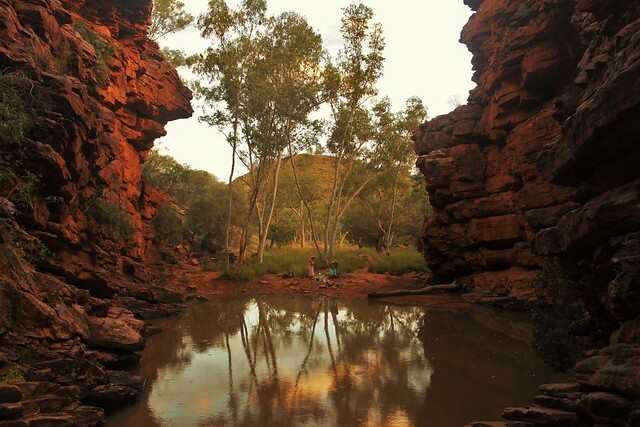 An amazing split through the mountains had created this stunning waterhole that slithered through jagged cliff edges. 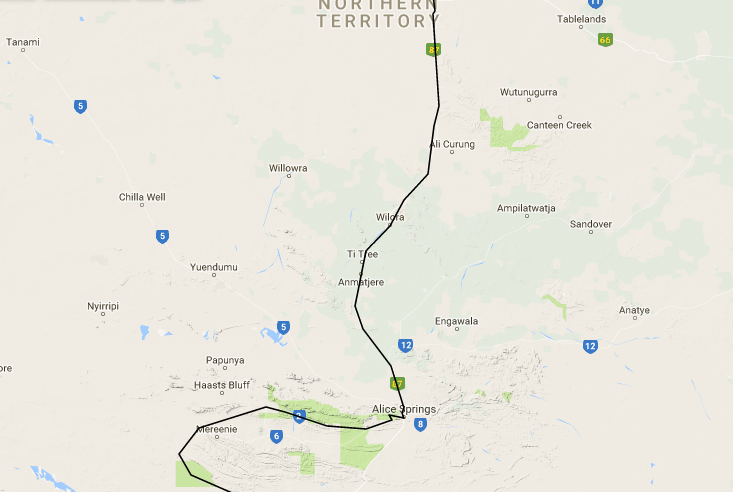 Already the 100km out of Alice Springs had been more exciting that the 1,500km from there up to Darwin! The waterholes are amazing out here in the desert. They attract so much wildlife. 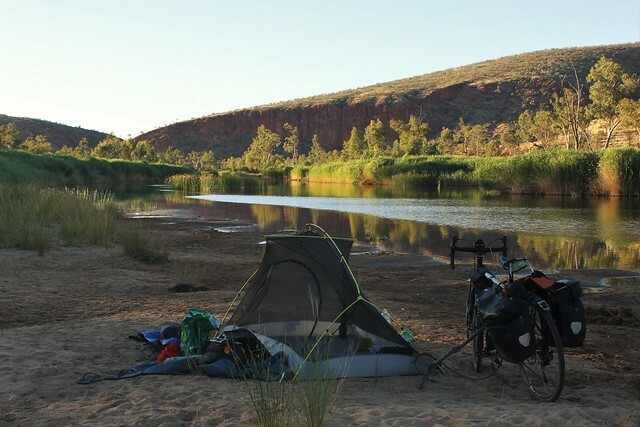 That night I pitched my tent by one of the Finke river waterholes. 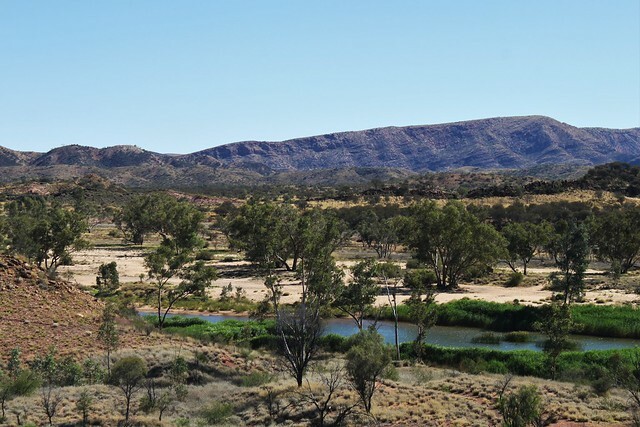 When (rarely) flowing it travels some 500km from the West MacDonnells to the aboriginal community of Finke south-east of here. There were fish in the water and ducks swimming around. I was very happy to have some water at hand to wash the dishes in for once! 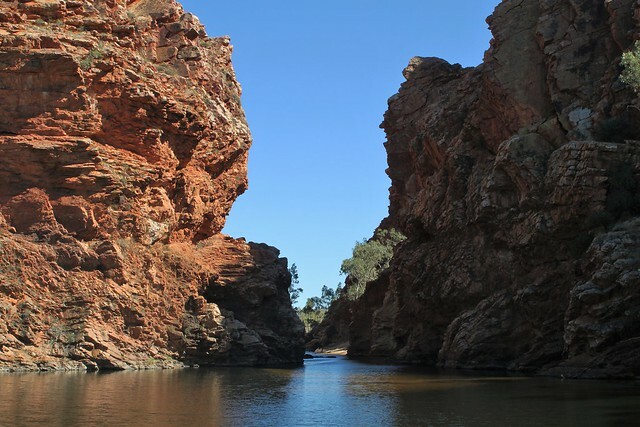 In the morning I had another swim in Glen Helen Gorge across the road. 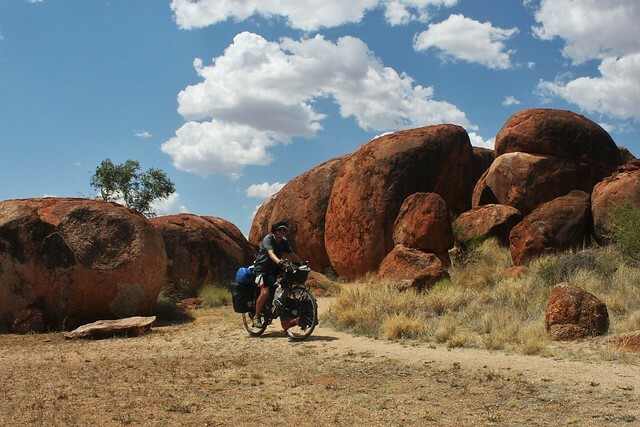 There was resort nearby where I could fill up water for the most remote stretch I’d ever cycled. 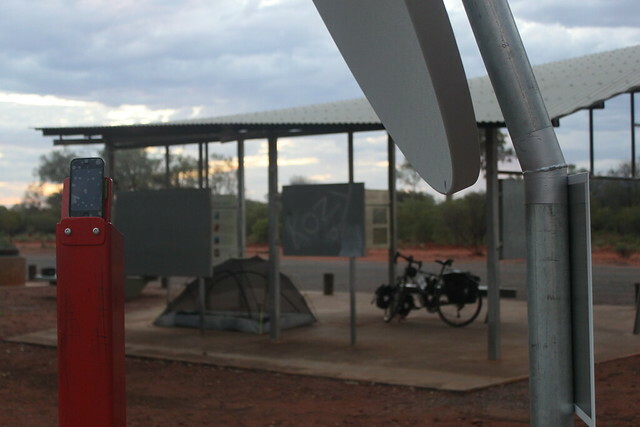 225km around the Mereenie loop until the next water point. The resort’s bore water tasted salty and horrible but beggars can’t be choosers. I strapped just over 20L to the bicycle and wobbled off feeling a little uneasy about the weight I was now carrying. 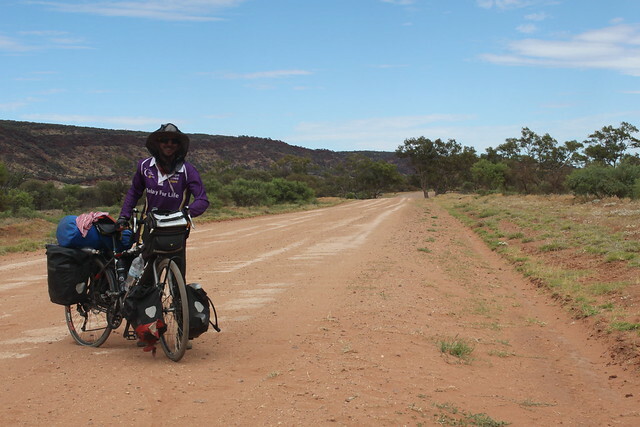 I crossed Tyler pass (receiving an amazing view of the Gosse Bluff) before the tarmac ended and I was on the dirt for the first time in Oz. 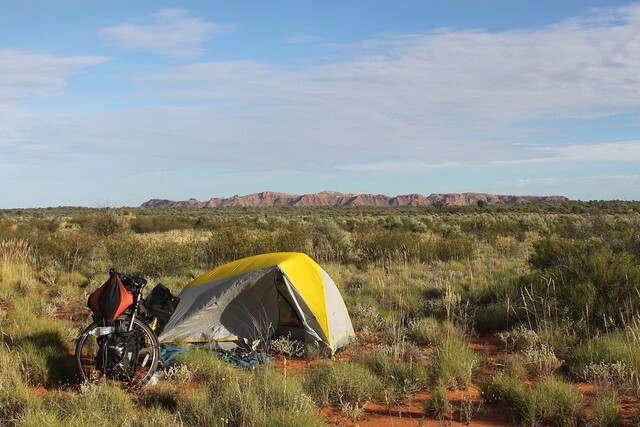 I dragged my bike into the bush and found a spot to camp with the big rock behind me. In the morning I was brushing my teeth when I heard a loud snort coming from nearby. I turned around and saw a herd of a dozen camels just 30m away. They are much bigger animals than I remember them being. Beautiful, strange things. Their necks moved like snakes to face me while their bodies stayed still and they eyed me up as I packed up my tent. 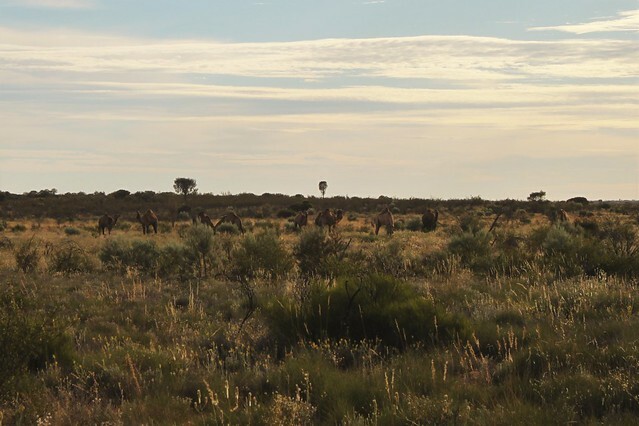 I’ve heard the Aussie outback is the only place in the world where there are wild camels. The ones I saw in Turkmenistan, Iran and China where all in domestic herds. The Australian ones were brought over from the Middle East as labour animals in the 19thC but became redundant as the infrastructure they’re helped build grew. Many were released and they prospered in the predator-free desert. The wildlife out here is amazing. The wallabies have disappeared but now there are new animals around. 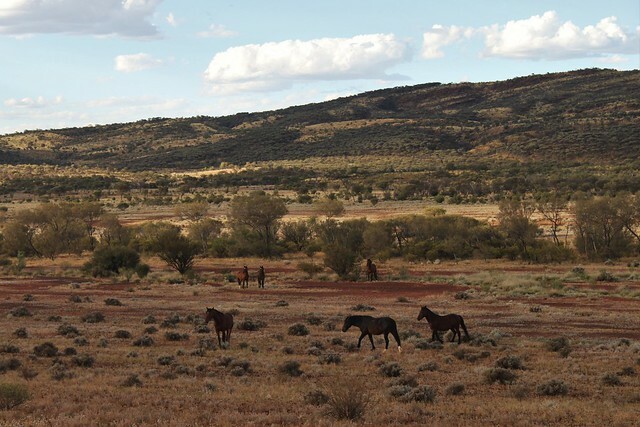 Earlier in the day I saw my first wild horses and the day before I’d spotted my first dingo (wild dog) strolling around. 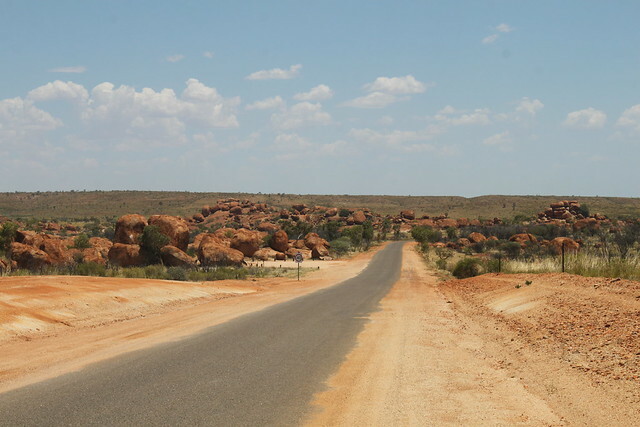 The Red Centre Way was tough cycling. The road was horribly corrugated in places but that was the least of my concerns. It was the sand that caused the real trouble. 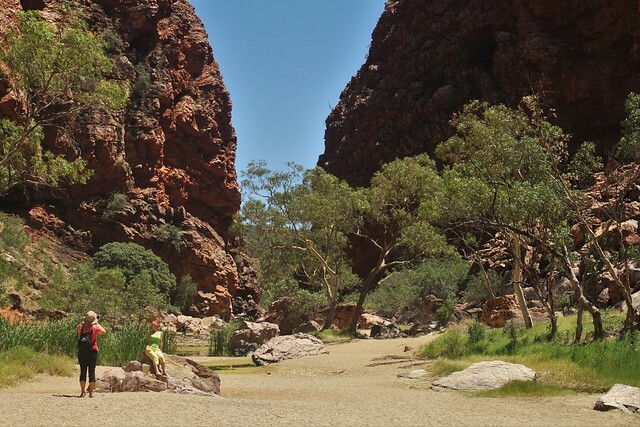 I left Redbank Gorge with about 25kg extra water and food. That means the bike and all luggage is probably about 70kg – that’s about 10kg more than me! With my narrow tyres I was sinking into the sand all over the place and it was frustrating riding. The heat is ridiculous and I need so much water to handle it. For every hour of cycling I get through a litre – I can get through 10L a day with cooking. On my second day riding the dirt road (I hadn’t seen any civilisation since the previous morning) a Jeep pulled over alongside me. There was an aboriginal family inside and the bloke driving leaned out and said “got any water”? I thought he was offering me some – people occasionally stop and ask me if I’m OK for water. “Think I’m alright, thanks though” I replied. He stopped and pointed to his bonnet. I’d misunderstood. He was asking me for water! He got out the car and lifted up the hood, pointing to where he needed to poor water in. The engine looked completely battered. “Is it an emergency?” I asked him. He shrugged. “I’m really sorry mate but I need every drop I have. You know there’s no water source until Kings Canyon. Perhaps you could flag another car down?’ I wasn’t being unfair – at this time of day (late afternoon) a car would pass me every hour at least. Driving a car you’d seen another vehicle every half hour. I hadn’t seen a car the first four hours of the day but that’s because I was camped so far from anywhere official. Most of the few people on this road are tourists. The insurance companies won’t let them take 2 wheel drives down this road and scare them into taking huge water flasks in case of emergency. Occasionally a dusty old 2 wheel drive zooms past me but I can guarantee the hand waving out the window at me will be a dark aboriginal one. 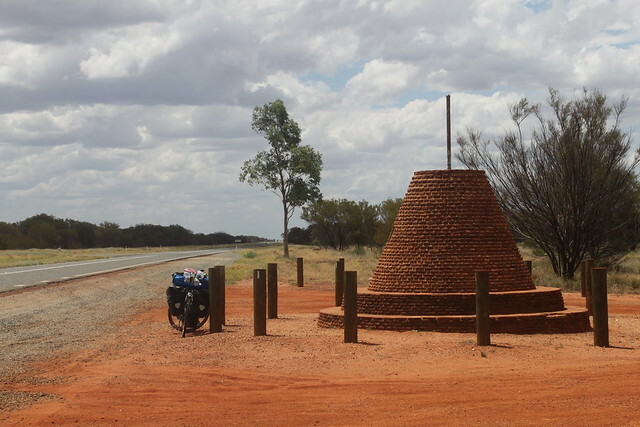 I suddenly wished I hadn’t been so polite to the bloke asking me for water – who in their right mind asks a cyclist riding a remote 200km+ water-less stretch in the burning sun? I wanted to make it without asking for extra but in the end I accepted a litre a passing car offered me on the third day. 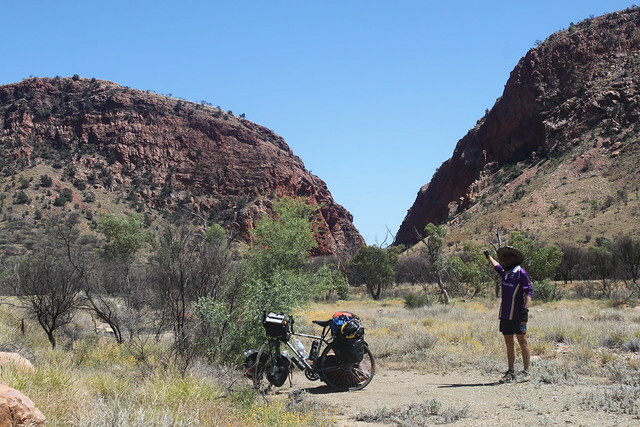 I eventually reached Kings Canyon Resort with only a drop left. 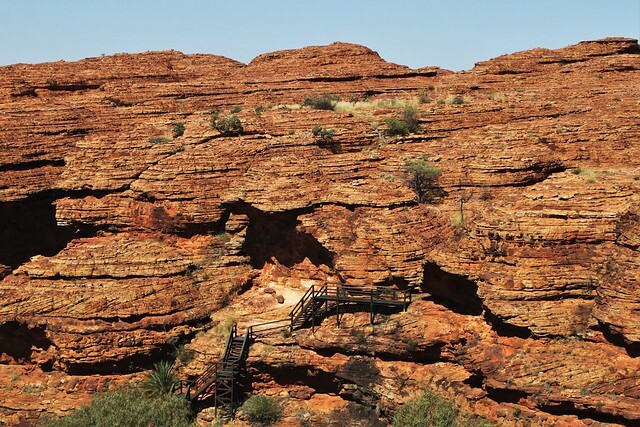 There were signs up at the resort saying that the canyon’s rim walk was closed after 9am on days above 36C. It’s around 40 everyday out here – there’s no need to check the forecast. You don’t want to know how hot it is in the sun, believe me! 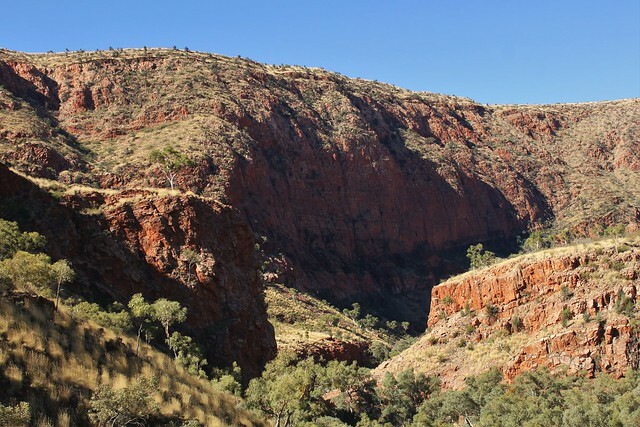 The canyon was just 10km down the road but there was no point arriving now, so instead I stalled and treated myself to a beer in the resort bar – God knows I deserved one. I can’t remember the last time I stopped for a mid-day beer. It was a regular part of my day in cheap booze countries (Eastern Europe, Caucuses, Central Asia) but not any more. I was drunk after two sips and felt guilty for having indulged. I must be getting old. I ignored the ‘no camping’ signs and found a stealthy pitch right outside the canyon entrance so that I could start the hike nice and early in the morning. The place was covered in warnings about the sun: urine colour charts, ‘how to drink water’ and ‘heat stroke kills!’ signs. 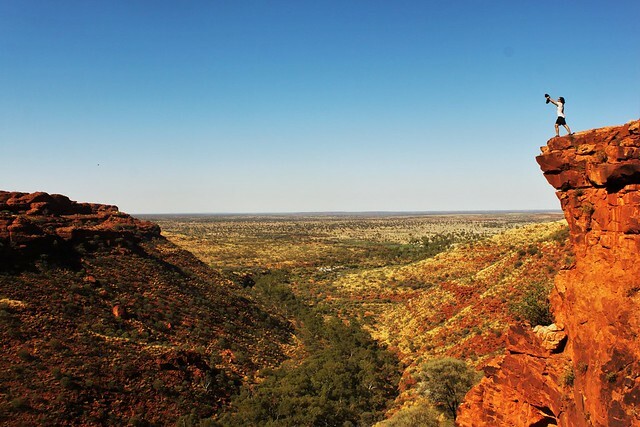 The ‘rim walk’ was a stunning hike around the canyon edge with wonderful views across the desert. 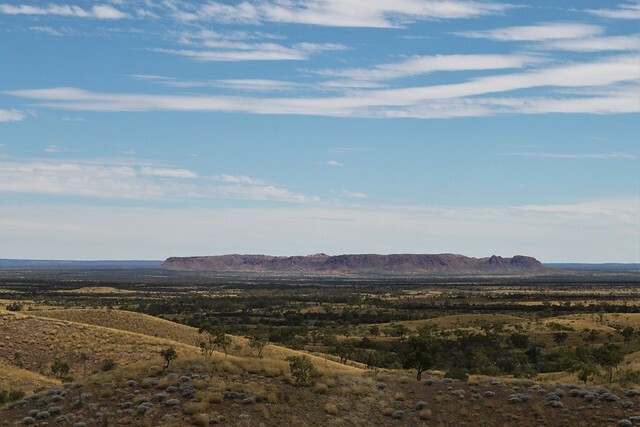 The landscape has changed again as three environments meet: the Western Deserts, the West McDonnell Ranges and the Simpson Desert all meet up here. that was a brilliant fun read. well done JKB. 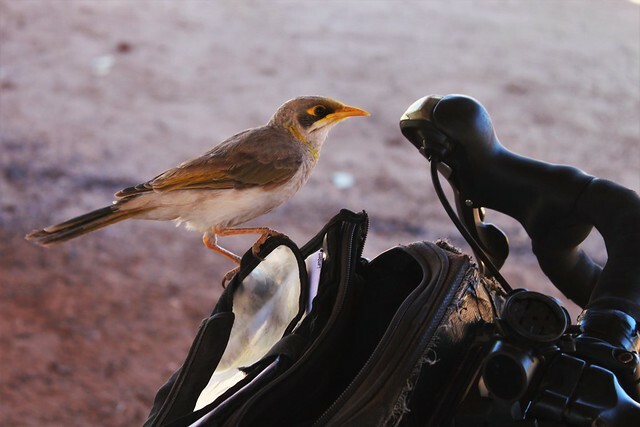 Keep pedalling…did you get pedal fixed before the Red Centre way? Thanks for your comments about the US election results. I am a US citizen and I heard the news in a Hanoi cafe and sat dazed, confused, scared, and dumbfounded with another American couple that happened to be there. Eventually, the wife asked her husband what he wanted to do (in Hanoi) the next day. He was quiet for a long while and then said, “Die.” If you make a US ride with a theme related to decency, tolerance, respect of others, you will get tons of support!!! And thanks for your blog. It is inspires me. I think your blog is so interesting. It makes me want to ride around the world too. I really like the way you talk about the Happenings. I my opinion the Pictures are amazing. The Lion king Picture is really funny. It really inspired me, personally. I would like to traval and see the whole world. For me, it`s amzing how Beautiful our world can be. I´m so happy for you that you enjoy this experience. Your blod is also really esay and fun to read.